A young man’s mysterious disappearance in Himachal Pradesh. A young man’s mysterious disappearance in the Himalayas. 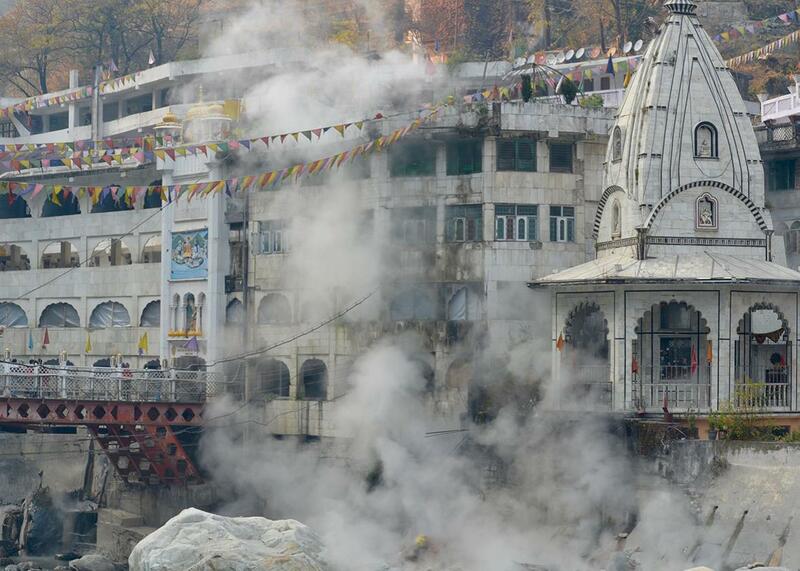 A Manikaran gurudwara, or Sikh temple, overlooking the village hot springs. Each week, Roads & Kingdoms and Slate publish a new dispatch from around the globe. For more foreign correspondence mixed with food, war, travel, and photography, visit its online magazine or follow @roadskingdoms on Twitter. After spending the final weeks of summer camped in a stooped, square-mouthed Himalayan cave, Justin Shetler was tired. The 35-year-old American outdoorsman had walked away from a job at a tech startup three years earlier, blogging about his growing unease with a life defined by stale luxury and high-end hotels. Since “retiring,” as he put it, in 2013, Shetler had set off on a series of daring journeys, donning a bark loincloth to hunt alongside Indonesia’s Mentawai tribe and trekking in duct-taped flip-flops across Tibetan snow passes. Then he bought a Royal Enfield motorcycle and started for India’s famed mountains. On his blog, Adventures of Justin, videos, podcasts, and photos chronicled his excursions, with Shetler’s long, sinewy frame posed artfully against spectacular backdrops: blurred, chalky stretches of shimmering desert; hulking green mountain ranges rippled with white snow. “I’m a nomad, adventurer, and ninja of sorts,” his Instagram bio read, “currently living in a cave in India.” The sporting tone of his prose drew a motley of envious followers on social media. “I am truly moved by your adventurous wild ninja story,” one commenter wrote. Shetler’s final entry came this past August. “A Sadhu has invited me on a pilgrimage,” he posted. Cold, weak, and underfed, Justin was steeling himself for one last adventure in Himachal Pradesh, a North Indian state popular with trekkers, hash-smokers, and spiritual seekers, before pushing on, by motorbike, to nearby Ladakh. The sadhu, or Hindu ascetic (known colloquially as a baba), had invited Shetler to follow him on a weeklong hike to the holy lake of Mantalai. “The trail is notorious and it’s landslide season,” he reported. “I should return mid-September or so. If I’m not back by then, don’t look for me,” Shetler added, signing off with an emoji wink. I spent the fall meandering through the same region as Shetler, in the scenic valleys of Kullu and Parvati on the way from Ladakh, taking time to write up a few articles I had spent the summer researching. Known alternately as the “hash trail” or the “hummus trail” (with an overlapping demographic in mind), the mountain route is clogged with backpackers in high season. Summertime vibes are festive, even giddy. Thousands climb the hills for bacchanalian full-moon parties, where DJs with names like Space Buddha and Mountain Monk spin psychedelic trance music. Others, like Shetler, come to ape the lives of local sadhus—followers of the formidable, three-eyed god, Shiva—squatting in stone caves and tree hollows. But the region is not just a hippie haven. Since 1998, more than 20 foreigners have gone missing from the hills, and most disappearances remain unsolved. Tourist traffic continues despite Parvati Valley’s ominous, Lonely Planet–christened nickname: the Valley of Death. By the time my overnight bus bounced me down the mountains back to Delhi at the start of October, Shetler’s family had sounded the alarm, mounting a GoFundMe campaign to launch a search party. “He left with a holy man on or about the 24th of August,” the page read. After running into a few trekkers on his return from Mantalai on Sept. 3, he was never seen again. “I’ve heard stories about the magical powers of these Babas,” Justin had written in an Instagram post. “They can bless or curse. … Police won’t arrest them; even for murder, which happens I’m told.” His sadhu guide, a middle-aged, Nepali-born holy man by the name of Satyanarayan Rawat, was nonetheless taken into police custody. Then came a sinister second act. A guard returned from a quick bathroom break to find the baba dead, hanging from the top bar of his tiny holding cell by his langot, a traditional Indian loincloth. It was all the guards had left on him throughout eight days of interrogations. 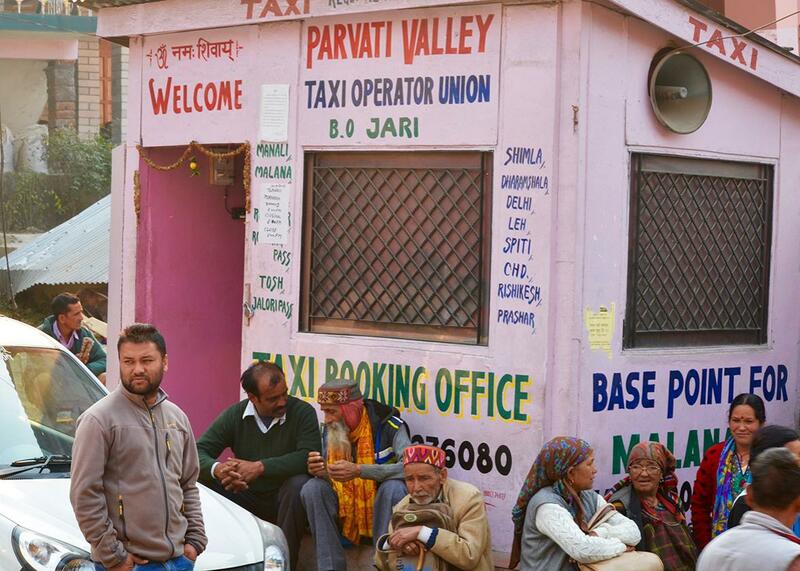 A taxi stand in Kasol, one of the region’s main tourist hubs. The news shook the region, bringing the hilltop state’s hotbed of contradictions—a mix of drugs, spirituality, and politics—to the fore. Shetler’s disappearance set off a firestorm of panicky tweets—#LostinParvati—and, later, an outpouring of digital eulogies. A prolonged forensic search concluded that Shetler had fallen into river rapids—but whether he was pushed or had tripped, no one knew. Shetler and I were distantly connected—a friend of my mother’s knows his family well—and traveled through the same places at the same time, but we never met. Still, the case obsessed me, likely on account of our parallels. For two months, I pored over news reports and Shetler’s own entries, looking for answers. Finally, this December, I decide to go back up into the mountains. On a frigid, foggy morning, I drop by the police outpost in Manikaran, a holy village renowned for its hot springs, where Rawat lived out his grim, final days. A small space heater glows red in the inspector’s well-furnished office. Down the hall, the cold, shadowy cell where the baba died now holds a new inmate lying stone-faced on blankets on the floor. Shetler’s exploits are well-documented, but all I knew of the baba was from Shetler’s last blog entry, a dim, somewhat mythologizing portrait—he describes the baba’s eyes as “5,000 years old”—of a kindly, mute figure (they shared no common language) who taught Shetler yoga and supplied him with chapatis and tea once he had run out of money. Pulling out a battered file, the subinspector relays Rawat’s brief life story. Disfigured by a skin disease, the baba claimed his wife and family had abandoned him in Nepal. (In his blog, Shetler assumed that the humps of flesh around his joints were the result of rigorous yoga practice.) A distraught Rawat wandered around India, was initiated by a sadhu, and came to Kheerganga the previous spring to begin his life as a hermit. In Hindu belief, the mountaintop retreat—named after kheer, or Indian rice pudding, on account of its fast-flowing river’s milky rapids—served as the honeymoon spot of Shiva and his divine consort, Parvati, and is imbued with power. In India, a controversial judicial procedure called remand allows authorities to hold suspects in custody before they have been charged. During these detentions, beatings, torture, and coerced confessions happen frequently. The officer who questioned Rawat has been suspended. I wonder what duress the baba had been under during those eight long days. 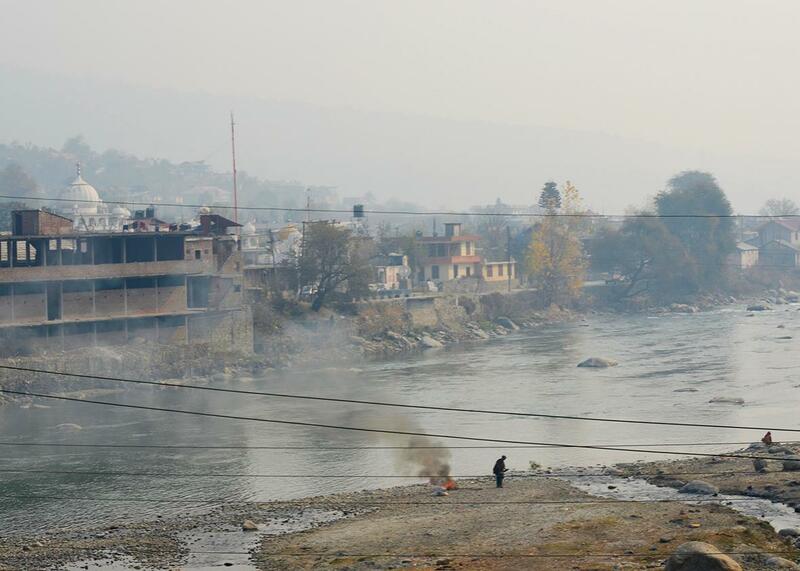 The banks of the Parvati River, on the road to Manikaran. Himachal Pradesh is world famous for top-quality cannabis, with harder drugs in local circulation, and the drug trade is to blame for some of the region’s seedier elements. Sporadic raids on marijuana fields and cursory checks on the grungiest-looking tourists have done little to quash the lucrative trade. In Hindu lore, Shiva was a hash-smoker, giving drug use a spiritual scrim. Sadhus spend whole days in stoned fogs, ostensibly as part of their devotional practice. Tourists follow suit, packing chillums—long Hindu pipes—with inky black hashish. I hear many people say that both Shetler and Rawat were heavy hash users—the concentrated form of marijuana preferred in the area—and one of Shetler’s posts described plans to smoke “probably 20 chillums a day” during their trek. With a wrestling match blaring on a tiny television, a conversation with a couple Indian guys up from the plains turns to the baba’s death, which they consider suspicious. “People who smoke up don’t commit suicide,” one twentysomething in black heavy-rimmed eyeglasses argues. Dim lights flicker on the dark, desolate hillside. In winter, only the most dedicated smokers brave the cold. “I’ve never even thought of suicide,” he adds, sucking on a huge, cone-shaped joint. In Kheerganga’s principal camp—a few wood-and-tarp structures gathered around a wind-lashed face of hill—I thaw by a café’s tandoor, or wood stove. The owner, Than, joins me on the floor, as does a bone-thin woman from Kiev, Ukraine—Lucia—with a sad, pretty face, wearing a dove-gray turban and a string of mala beads. On the wall, a giant mural depicts Shiva’s blue fist wrapped around a giant chillum, entwined with a slit-eyed cobra. Underneath, someone has crudely scrawled a white lotus, the political symbol for India’s ultranationalist, Hindu ring-wing government, the Bharatiya Janata Party, or BJP. “No one knows what’s cooking in someone else’s head,” Than says. By her side of the fire, Lucia starts to get agitated. “I would rather give money to a baba than an agency. I would be more safe.” Gamely, we ask why. “Because he knows what is life!” She sits back, triumphant. Later, Than tells me more about Lucia. “She doesn’t have any money, visa, you know. We give her food sometimes,” he says. Generous to a fault, Than’s staff even sets out biscuits for the rats that come out each night. “So many times they save my life,” Lucia confirms, kissing her own open palm. At noon the next day, sun fills the valley, the barren grass glowing gold. I trek up to a flat, boulder-strewn clearing, the annual summer meeting point for the Rainbow Gathering, a drug-fueled music festival. A long-extinguished bonfire lies empty, and the valley is quiet, save for the distant chatter of birds. I see a young Indian guy lying on a mound of rock, basking in the sunshine. He’s wearing a faded black track suit and has long, shaggy hair past his chin. 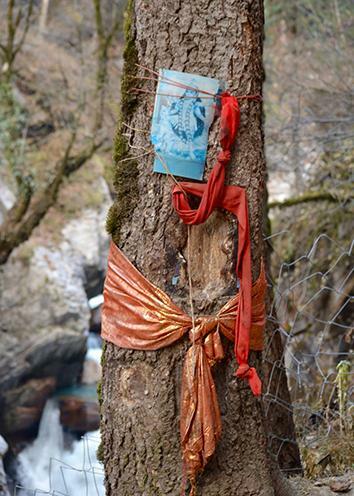 A hologram of Kali, the fearsome Hindu goddess who liberates souls, wearing a garland of human skulls, pinned to a tree near Kheerganga. He disappears down the hillside, and I take his spot on the rock. The facts tying Shetler and the baba together start to feel like a dream, their contours changing the closer I get. In any case, the case is closed—the trail cold now, iced over, still twisting and turning but leading nowhere. Twinned downfalls, their deaths will stay unsolved. For now, there is relief that the search is over, even if the cause of Shetler’s death remains unclear. “There were many stresses, with police coming,” Lucia tells me back in Than’s camp. We watch the sky darken from behind flaps of plastic sheeting, the café’s makeshift window, and the room grows icebox cold. Like Shetler, she seems to be on an incomprehensible, solitary quest.